Across much of the OECD, the share of national income taken by the top 1% of earners has risen, sometimes sharply, in recent decades. The rise has been particularly striking in the United States: in 1980, the top 1% of income recipients in the US earned 8% of all pre-tax income; by 2012, their share had risen to over 19%. Other OECD countries also saw big rises, including the UK and Australia. The rising income share of the 1% has become a hot issue, but some observers believe this focus actually misses much of the story of rising income inequality. As well as looking at the top 1% of earners, they argue, we should also look at an even smaller segment–the top 0.1% of earners (1 in 1,000), and even the top 0.01% of earners (1 in 10,000). As the Nobel laureate Paul Krugman has noted, data from the US Congressional Budget Office shows that between 1979 and 2005, the after-tax income of Americans in the middle of the income distribution rose by 21%; among the 0.1% it was up 400%. Understanding these figures is important if we want to develop a better picture of who’s benefiting from economic growth. For example, in the decade to 2007, real household income increased by an average of 1.2% a year in the US. But when the top 1% of earners is excluded, that figure falls to 0.6%. In effect, the 1% took 58% of the gain in real incomes. So, what looked to be an overall improvement in the population’s economic well-being actually benefited a much smaller group than the broad figures seem to suggest. Some of the top earners are household names–sports stars like Serena Williams and entertainers like Jackie Chan and Taylor Swift–but most are not. In the US in 2010, the largest group, about 41%, was made up of executives in nonfinancial businesses, like Apple and Walmart. Around 18% were employees– and not necessarily executives–in banks and finance houses. In the UK, the finance crowd accounted for about 21% of top earners and in France about 15%. The fact that so many of the top earners work for a living is striking. 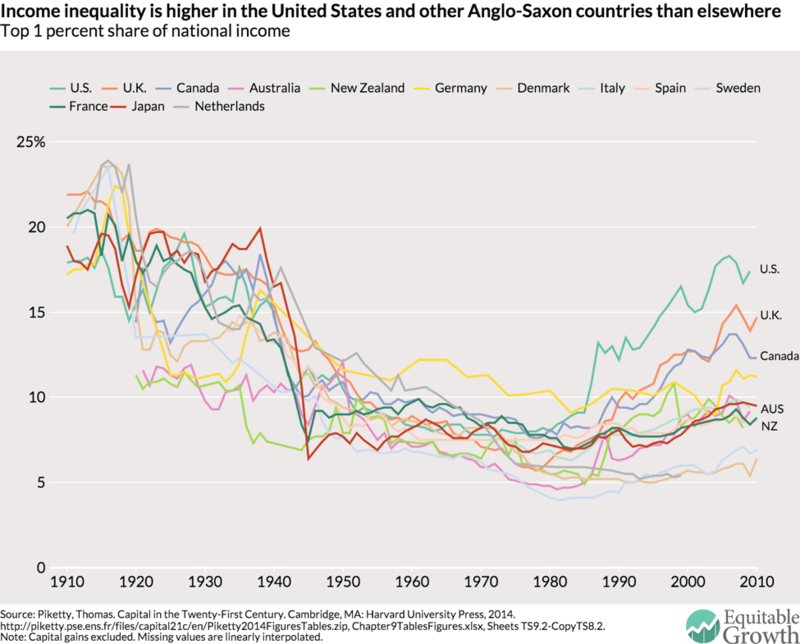 Back in the early 20th century, when income inequality last reached the levels we’re seeing today, much of the income of top earners came from rents on land and property as well as income from investments in government bonds. By contrast, today’s top earners are more likely to be either a salaried employee, for example an executive like Morgan Stanley chairman James Gorman, or a company founder, like Facebook’s Mark Zuckerberg. Why do the 1% earn so much? There’s no single answer to why the 1% earn so much. Multiple factors have contributed to the rise of top incomes, and the significance of each of these is not the same in every country. […] The rapid expansion of finance has contributed to income inequality in a number of ways, the most obvious being that financial sector workers tend to be very highly paid. In Europe, they account for 1 in 5 of the top 1% of earners even though, overall, they account for only 1 in 25 of the total workforce. These high salaries might be justified if such workers had very high levels of productivity. However, comparisons with similarly skilled workers in other sectors suggest this is not the case. Financial workers– particularly the highest earners–thus seem to enjoy a wage premium over other comparable workers. “Too much finance” fuels income inequality in other ways, too. The wide availability of credit allows high earners to increase their borrowings, allowing them to gain more from investment opportunities than people on lower incomes. In addition, higher earners also benefit from the expansion of stock markets. That’s because they are always more likely to hold shares than lower earners. As markets expand, they benefit more from share dividends and capital market gains. Changing pay norms: Societies differ in the extent to which they accept large income differentials. Implicit in these social norms is a trade-off: Stick to society’s expectations and you preserve your reputation; breach the expectations and you’ll earn more but hurt your image. But these norms can change over time and their influence can vary markedly. In much of the post-war period, there was an expectation that income differentials would be–by today’s standards–relatively narrow. But in the 1980s these norms began fading, especially in Englishspeaking countries. By contrast, they still remain relatively strong in much of continental Europe, which has certainly played a role in limiting top incomes there.